Try our tasty Stuffed Ancho Chiles tonight. 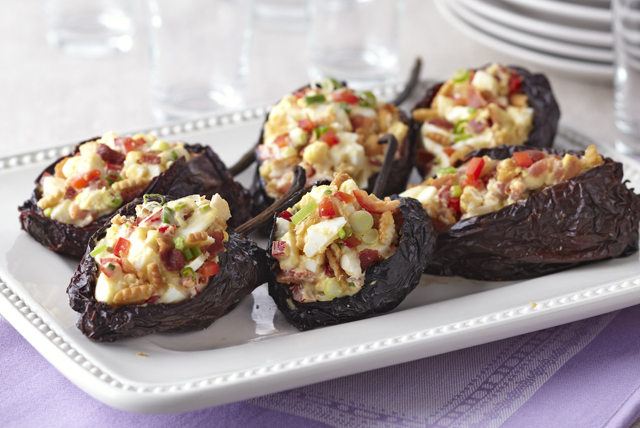 Our Stuffed Ancho Chiles are packed with egg salad and bacon for a surprising and unforgettable taste. Mix all ingredients except ancho peppers. Make small lengthwise cut in side of each ancho pepper; remove and discard seeds. Fill peppers with egg mixture, adding about 1/2 cup to each. Cook peppers in boiling water in saucepan 10 min. or until slightly tender; drain. Cool.